Allows you to recover your username and password for your Steam login for Valve games locally from your computer. This method works if the “Remember My Password” was selected before logging in. It also will work if you didn’t select “Remember My Password” but are currently logged into your Steam account. Built in pure Assembler language this program is only 8.5kb and fits perfectly on a thumbdrive to carry with you anywhere. When you visit website ftp site in Internet Explorer version 4.x-6.x and you choose the “Remember password” when you login, the password is saved in the Protected Storage in the registry, and this utility can recover it. You can browse the above key in the Registry Editor (RegEdit), but you won’t be able to watch the passwords, because they are encrypted. Also, some passwords data are hidden by the operating system. 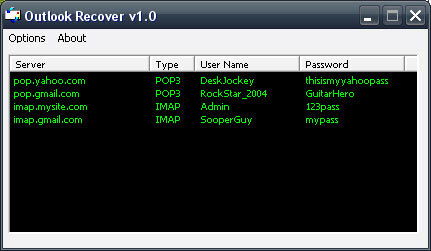 We are releasing a Demo version of IE Recover that recovers the first 3 characters of your password. The full version is available for $4.99 that shows the complete password. Built in pure Assembly language this program is only 7kb and fits perfectly on a thumbdrive to carry with you anywhere. Help support this site by purchasing it ,so we can continue to off you the latest password recovery info. You can purchase through paypal or e-gold from the links below. Thank you. When you create a mail account in Outlook Express or a POP3 account in Microsoft Outlook, and you choose the “Remember password” option in the account properties, the password is saved in the Protected Storage in the registry, and this utility can recover it. We are releasing a Demo version of Outlook Recover that recovers the first 3 characters of your password. The full version is available for $2.99 that shows the complete password. Built in pure Assembler language this program is only 7kb and fits perfectly on a thumbdrive to carry with you anywhere. Help support this site by purchasing it ,so we can continue to build and maintain resources that is relied on by IT techs / people in all kinds of situations. Which allows you to recover your username and password for your Steam login for Valve games locally from your computer. 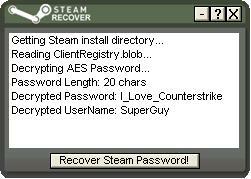 We are releasing a Demo version of Steam Recover that recovers the first 3 characters of your password.